It has come to be recognized across the board by the Indian nation, or for that matter by the world over, that true democracy can be realized only through devolution of power to the people through self-governing institutions at a very local level of community organization. The 73rd amendment Act of 1992 requires Panchayati Raj institutions to be endowed with adequate responsibilities and powers so that they may be enabled to function as “institutions of self-government”. Sweeping legislations are being made across the various states in India to follow up on this amendment. But, this change in perspective and understanding has not yet influenced the thinking of church leadership in India, especially in regard to the nature of church polity and administration. Although, some of the recent judgments of the Supreme Court of India have forced the Syrian Churches in India to decide their disputes taking the majority view of the congregations, thus acknowledging the supremacy of congregations over the prescriptions of Patriarchates and Catholicates. 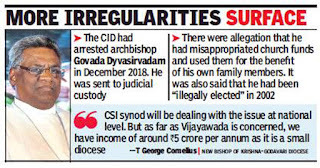 In this backdrop, it is important to look at the turn of events in the Church of South India (CSI) which have somehow made the episcopacy and the diocesan polity into instruments for arbitrary and ruthless exercise of power over the congregations. The congregations no longer have any say in matters regarding the appointment of their pastors and the alienation of their valuable properties, often bequeathed to them by the missionaries or their ancestors. The episcopate, abetted by an authoritarian, caste-ridden and patriarchal cultural ethos, has become dictatorial. Bishops consider dioceses as their fiefdom; constitution is given a go by and constitutional bodies have been made to subserve the interests of the bishops through a mystique of divine power, arbitrary exercise of “ecclesiastical authority” and threats of punishments, and dolling out of largesse. Power has become concentrated in the hands of a coterie, undermining democratic functioning of elected bodies. Thus, corruption and mismanagement of church properties has become institutionalised. The CSI has a church polity in which pastorate committees, except for the chairperson, have very limited autonomy or administrative powers. 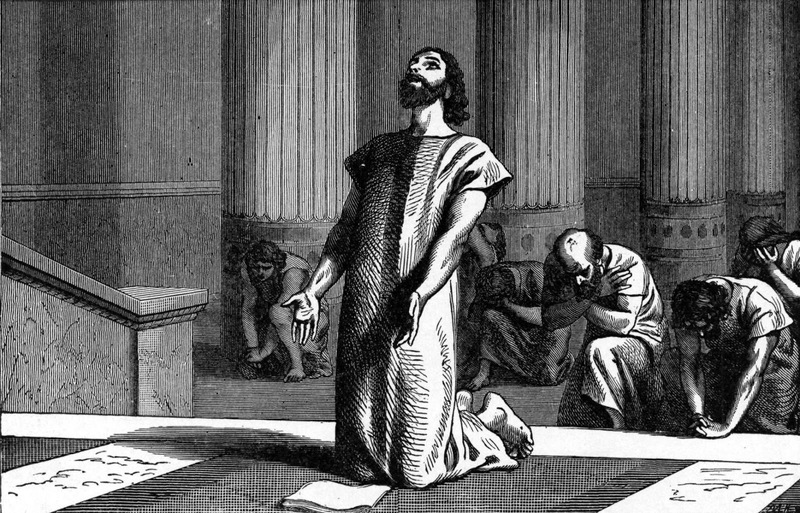 The chairperson of the pastorate committee can only be a member of the ordained clergy (the presbyter in charge) and whose primary loyalty is to the bishop, from whom he derives his power. The Governing Principles of the CSI Constitution, while acknowledging the role of the pastorate committees as having general oversight of the pastorates, gives the dioceses the right to lay down “the manner and limitations of their oversight”. While all the administrative functions of the pastorate committee are delegated to the chairperson, all the spiritual duties are listed under the tasks of elders such as “helping” the presbyter, “visiting” the sick, settling disputes, “read lessons”, “help the pastor in conducting of Divine service”, "collection of subscriptions and contributions”, “zealous in spreading the Kingdom of God” and so on (Constitution of the CSI North Kerala Diocese). The constitution has effectively turned the people in the pew and the pastorate committees into ciphers. The latter have no say even in the “arrangement and introduction or removal of furniture inside the church”. The clergy change every three to four years and yet, those permanent members of the congregation who have laboured for the construction of the church, and contributed to its growth immensely for many years must silently suffer the hubris of a new pastor who, with the blessings of yet another new bishop, push “furniture”, people and tradition around according to their whims and fancies with callous disregard for the members in the pew and the pastorate committee. While the Governing Principles of the CSI Constitution very feebly affirm, “every pastorate shall have certain authority within its area, shall have certain responsibilities in Church Discipline, and shall have an opportunity of expressing its judgment both as to the appointment of its pastor and the selection of candidates for ordination from that pastorate”, in reality, the constitutions of the dioceses do not treat them with any sense of rights and dignity nearing what is described therein. The next layer higher up in the hierarchy is that of the bishops and the dioceses. In the diocesan structure the bishops are given extraordinary powers. They, in turn, transfer this to the clergy ensuring that they remain loyal to the bishops rather than to the pastorates and the people who support them financially by their subscriptions and tithes. However, there is no clearly laid out procedures by which a bishop can be made accountable either to the diocesan council and related bodies or to the Synod. Thus we have 22 fiefdoms which are ruled autocratically by a monarchical episcopate against the intentions and wishes of the founding fathers. This situation is further complicated and worsened by the involvement of a subservient clergy and other employees of the diocese in decision making bodies. They become easy prey to threats and inducements. Transfers and postings in congregations and other institutions have been an important means of manipulating them to slavish obedience to the dictates of the bishops. Erosion in the standard of the clergy in their theological formation, general education, astuteness and moral fibre has also come to shape the subservient role and the sycophancy surrounding episcopal authority. Vast assets, both landed properties and institutions, inherited from the missionaries at prime locations come in handy to the bishops to bolster their arrogance and dictatorial ways. CSI Trust Association (CSITA) is credited with the task of holding in trust the valuable properties bequeathed to us by the missionaries. The assets that the congregations have procured either as landed properties or church buildings and other commercial ventures are also given over to the CSITA. But then, the CSITA act without any authorisation from the local congregations, collude with the bishops and alienate valuable assets of the congregations when its role is solely to manage the properties on behalf of every member of the church and its congregations. By its own admission in the income tax returns, the CSITA acknowledges that it is only “a bare and passive trustee”. A bare and passive trustee is one in whom property is vested simply for the benefit of another person till such time the cestui que trust claim possession of the property or deal with it as per his direction. As such, the CSITA cannot be a party to alienating lands and other assets of the church. While this is the real fact, the bishops and the Synod have been deluding the congregations and its members by its authoritarian ways and acting as if the CSITA can do whatever it pleases with the assets of the church and therefore have the right to alienate them at its will. However, the CSI constitution is very explicit in the understanding that it is only with the full consent of the congregation that the executive committee or the property committee can initiate any action to sell or lease any property of the trust. When it comes to properties that we have inherited from our forefathers or the missionaries, we are morally bound to use it for evangelistic purposes for which they have bequeathed them to us. However, today, instead of seeking new and relevant ways of evangelism and service to the community, the properties are perceived only in terms of its real estate value as in the case of Ahab, while the Christian attitude should be that of Naboth who had refused to alienate his vineyard for attractive terms of exchange, since the land was invaluable to him as “the inheritance of my fathers” (I Kings. Ch. 21: 14). The injustice becomes more evident when one observes that a local community buys a piece of land and builds up a church and associated infrastructure; then, comes an “upstart” bishop touting his authority and scepter of excommunication to cow them to submission and to establish his will on them, be it a matter of posting a pastor, dismissing an elected committee without adequate reason or consultation, or even making an ecclesiastical visit without invitation or information and against the will of the congregation. These are things that really happen against the wishes of all those who have worked for the church union. To a large extent, the shape episcopacy has taken in CSI is unimaginably more authoritarian with accumulated vested interests than that of the Eastern churches. These churches have a long history of hierarchical episcopate, but surely, hierarchical ordering in itself need not be authoritarian. As the bishops in the Eastern churches lead the life of an ascetic, a sanyasi, particularly, opting for a life of celibacy, in theory, these bishops are expected to confine their role to more theological and spiritual matters rather than to temporal concerns of property development and transactions. Moreover, an election to the bishopric is subject to multiple layers of screening process. The church would have a list of celibates from whom they could elect a presbyter to bishopric. From this list, shortlisting is undertaken by a screening committee, carefully scrutinising all aspects of the life of a clergy before he is presented before the Sabha Mandalam for voting for bishopric. This rigorous process of screening and shortlisting helps to ensure the integrity of those who are, then, voted to the office. Of course, this is not to say that, in practice, even the above mentioned process has not been subject to manipulation. In CSI, there is no such screening process. Even presbyters who do not have a basic B. D or M. Div theological degree and have character anomalies can contest and get elected to the panel for bishopric and then subsequently be nominated to this office by political manoeuvring and payoffs involving huge sums of money. There are bishops in CSI who have only a B. Th degree, but then, go around prefixing ‘Dr.’ to their names. While, in the earlier days, the CSI was known for its educated clergy both in secular and theological education, today the situation is just the reverse. The Eastern Orthodox/Jacobite Churches and the Marthoma Church generally have a well educated clergy, often trained in their own best theological seminaries. As a result, our standing in the ecumenical world has been considerably diminished. We do not have the kind of clergy or episcopal leadership as that of the stature of Bishop V. S. Azariah who could set the ecumenical agenda of his day and command the respect of an ecumenical community. Particularly important is the fact that 65% of the membership in the Sabha Mandalam is from the laity and only 35% from the clergy. There are several layers of checks and balances. The laity, being in the majority, are expected to play a significant role in matters of administration and policy decisions (though in practice, this may not always be the case). The clergy-laity proportion even in the Malankara Syrian Christian Association is 1:2. 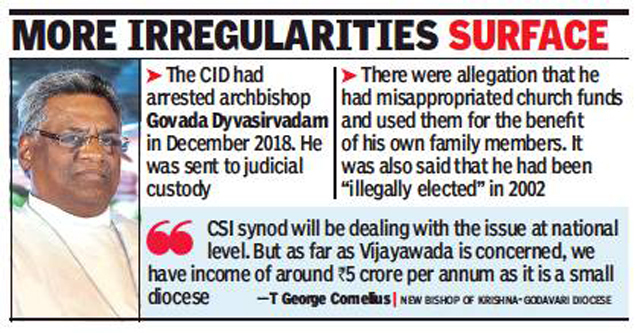 But, till recently, the clergy-laity proportion in the diocesan councils and other administrative bodies of the North Kerala Diocese and of many other dioceses of the CSI have been highly skewed in favour of the clergy. When there is a predominance of the employees of the diocese in decision making bodies, either as clergy or employees in institutions, the chances for those in authority influencing them with threats and inducements will be very high. In the Marthoma Church, the transfer of clergy does not rest with the diocesan bishops, rather with the Metropolitan in the Synod. Many things that have been happening in the CSI are against the protestant and reformed tradition and the enlightenment and democratic ethos that were associated with these historical movements. Democracy rests on two pillars: (1) the utter depravity and sinfulness of human beings and (2) the dignity of each human being as created in the image of God. The first, the deprived and sinful human condition affirms the fallibility of human beings and all human authorities, which, as a result, requires checks and balances within any system of governance. “Power tends to corrupt, and absolute power corrupts absolutely” (Lord Acton). Power of any human authority has to be checked and kept under control and democracy is believed to hold a promise in this direction. Second, the Christian and biblical affirmation of human dignity is exemplified in the fact that human beings are created in God’s own image with certain inalienable rights and that no human being can be considered ‘worthless for whom Jesus Christ died’. Hence, democracy again is believed to hold the promise that every member of the society is respected and his/her views are heard. It is this democratic tradition that is being negated when a bishop repudiates the CSI constitution and takes on to himself “ecclesiastical authority”, which neither our tradition nor the constitution expect them to exercise. The Moderator and the Synod intervene only under extreme circumstances and by that time, enough damage may have already been done. Most often, the Synod and the Moderator cannot intervene as their credibility and moral stature would be worse than that of the diocesan bishops and their cronies. They also suffer from the same malignancy. Once Synod elections are over, the Moderator and the General Secretary have a free hand in managing the affairs of the Synod without much checks and balances. Often Synod elections are fiercely contested with huge sums of money changing hands. Then, the newly elected executive committee and the Synod officers collude to ensure that their efforts are amply rewarded. Moreover, they remain far away from the people and the public glare except as people who are revered for the high office that they hold and the ‘divinity’ associated with it. They, then, elect themselves as the CSI Trust Association, and preside over the plundering of valuable assets passed on to them to the negation of their role as trustees. Recently, it has been the agenda of the bishops to initiate a number of “development” projects, a misnomer for engaging in activities by which they can regain the capital that they have transferred for nomination to bishopric. This involves starting self-financing professional courses such as B. Ed, Dental and Nursing Colleges, leasing out buildings and properties in prime locations, developing shopping complexes, and outright selling of lands, again in prime locations. This has come to the point where a bishop openly proclaims that the CSI is on a mission to explore the potential for a business venture in tourism. Appointments of teachers and admission of students are also occasions for illegal gratification. The casualty is mission and evangelism, which is glossed over for developmental activities. Majority of Dalit parishes in rural areas have been lost to us through pastoral neglect. The schools and colleges of missionary days remain unattended and uncared for. The concern for equity and empowerment of the poor and the down trodden have been completely sidelined to accrue crass financial gain through self-financing institutions. Dalit has become a word used more often to attract foreign funds rather than a focus for solidarity, for social justice and liberative action. When the mission in education, the only cultural instrument that can provide equity and empower people, is turned into commercial ventures to benefit the elite of a given society, all the tall talk of mission in education become a sham and the memories of the missionary stalwarts who paid by their lives to establish such centres of knowledge especially for the most vulnerable sections of the society stands desecrated. Unity, renewal, mission slogans with which many of us grew up have ceased to be part of the vocabulary of the church; the people in the pew are left to fend for themselves and poached by all and sundry evangelists who come with bags of dollars. Even bishops fall prey to them. The CSI is also faced with the daunting task of convincing the people in the pew that they are the church and they are the “royal priesthood”, and more than being serviced by the clergy, they have a role in the world of “proclaiming the good news of the gospel and driving out the demons”. They are kept under submission by a mystique of divine power. The sacraments and the “full privileged membership” are considered means of salvation without which they are destined for perdition, rather than means of empowering oneself for the task of Christian witness in the world. The clergy intentionally furthers a theology and biblical interpretation that legitimises this perception of discipleship and the church being in the world as a religious community for its own salvation. This is further buttressed by the casteist and feudal world view and the related spiritual notions and practices that are very much part of the cultural milieu. And for a majority, church also means “favours”, once doled out by the missionaries and today by their counterparts in the persons of bishops and clergy. There is nothing much to salvage except to ask the judiciary to put in place an officiating administration for an interim period and during which a commission constituted with the involvement of the partner churches may go into the various aspects of the structure and functioning of the CSI. 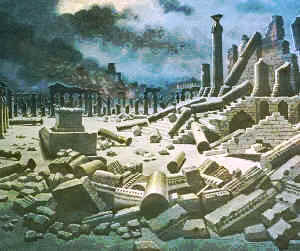 And then, based on the commission’s recommendations, the CSI prepare itself for radical restructuring. One direction in which this change can be envisaged is by stressing a more Congregationalist polity with its associated recognition of the theological emphasis on the priesthood of all believers and of the various gifts, ministries and operations which are given to us by the Holy Spirit for “building up the church”. Congregationalists played a prominent role in the formation of the CSI in 1947, and they also became part of the United Church of Canada and of the Uniting Church in Australia. The strong convictions concerning the sovereignty of God and the priesthood of all believers have led many of them to adopt a theological and social liberalism, and to participate in the ecumenical movement. The promise of a revival among the laity, their active and decisive involvement and participation in the life of the church and also their public witness in the secular world are inherent in a Congregationalist polity. 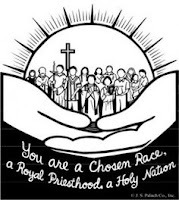 The ordained ministry, in a Congregationalist polity will not easily be corrupted by any vestiges of “priesthood” and “priest craft” and will give way to an understanding of their role as that of an “elder”. The congregational emphasis could be kept in balance with a Presbyterian polity in the office of episcopate. 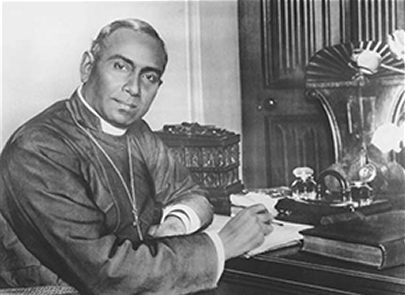 During the negotiation for church union, the South India Union of Churches (SIUC) faction, which comprised of the Congregationalists and the Presbyterians, was very much concerned about the shape that episcopacy would assume in an authoritarian, hierarchically ordered and caste-ridden society like India. Their worst fears have come true and the Episcopal and Anglican traditions have completely taken over the manner and content of the church’s presence and witness in the world and have become a source of much corruption in high places. The suggested changes are not easy to come by. The entrenched forces of evil, injustice and oppression will not easily give up their “ecclesiastical privileges”. And a change can be effected only with much zeal and suffering equaling the one that was shown during the union negotiations. With majority of the members being indifferent to what is happening in the church except the respectability associated with it, a popular uprising cannot be expected at the moment. But a spiritual revival under a charismatic leadership or a sustained effort by a remnant prepared for the long haul, bearing the cross, could be a promising prospect that can change history around. In any case, all this calls for a complete overhaul and a radical restructuring without which CSI will have no future. It is already dead spiritually and is stinking. Repentance and Prayer in “sack clothes and ashes” by a fearless and committed group of laity, a remnant, is the need of the hour. Hope and pray that the spirit of Christ would sweep over us all and make us live.